Hub of the American auto industry and site of the celebrated Riverfront Renaissance, Detroit is also a city of extraordinary poverty, unemployment, and racial segregation. This duality in one of the mightiest industrial metropolises of twentieth-century North America is the focus of this study. Viewing the Motor City in light of sociology, geography, history, and planning, the authors examine the genesis of modern Detroit. They argue that the current situation of metropolitan Detroit-economic decentralization, chronic racial and class segregation, regional political fragmentation-is a logical result of trends that have gradually escalated throughout the post-World War II era. Examining its recent redevelopment policies and the ensuing political conflicts, Darden, Hill, Thomas, and Thomas, discuss where Detroit has been and where it is going.In the series Comparative American Cities, edited by Joe T. Darden. ""Anyone interested in urban economic development, the politics of economic development, and American race relations will find [in this book] a fascinating and careful analysis of Detroit's rise, fall, and ongoing comeback struggle.... of particular interest to urban planners and researchers concerned with urban decline in North America and Western Europe."" """Detroit" is a wonderfully thorough compendium of urban inequality. It should quickly establish itself as the definitive study for Detroit-area planners and policy makers. For teachers and students in the Detroit metropolitan region, this book will prove invaluable as a reference text. The quantitative data are presented with minimal, but appropriate, statistical analysis, helpful maps, and well-organized tables. The case studies of struggles for school and housing integration make up some of the most readable sections of the book and power structure research methods are used to shed new light on such development projects as the Renaissance Center."" ""The book offers fine treatments of the rise of black political power, of the efforts to rejuvenate downtown and the waterfront, and of the debt of the city in efforts to acquire new industrial and service-oriented development. Overall, Detroit ably achieves the goals of the series. The perspective is truly interdisciplinary, reflecting the authors backgrounds. It is a thoroughly enjoyable geography, in the best sense of the word, of the Detroit metropolitan region."" "Anyone interested in urban economic development, the politics of economic development, and American race relations will find [in this book] a fascinating and careful analysis of Detroit's rise, fall, and ongoing comeback struggle.... of particular interest to urban planners and researchers concerned with urban decline in North America and Western Europe." "Detroit is a wonderfully thorough compendium of urban inequality. It should quickly establish itself as the definitive study for Detroit-area planners and policy makers. 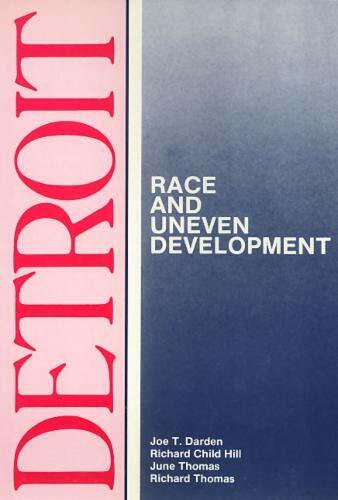 For teachers and students in the Detroit metropolitan region, this book will prove invaluable as a reference text. The quantitative data are presented with minimal, but appropriate, statistical analysis, helpful maps, and well-organized tables. The case studies of struggles for school and housing integration make up some of the most readable sections of the book and power structure research methods are used to shed new light on such development projects as the Renaissance Center." "The book offers fine treatments of the rise of black political power, of the efforts to rejuvenate downtown and the waterfront, and of the debt of the city in efforts to acquire new industrial and service-oriented development. Overall, Detroit ably achieves the goals of the series. The perspective is truly interdisciplinary, reflecting the authors' backgrounds. It is a thoroughly enjoyable geography, in the best sense of the word, of the Detroit metropolitan region."